This 20 year old brandy comes in a wooden box with a sliding front panel. 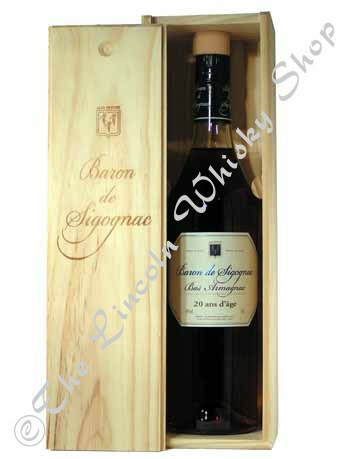 Legend has it that Baron Sigognac took all the traditional clocks out of his cellar and replaced them with his own. These had ten divisions instead of twelve, the seconds became years, the big hand moved only once each decade and the hour hand marked the centuries! In time even these clocks were left unwound and he depended soley on his palate to tell the age of an Armagnac. Brandies from the Armangnac region of France have a distinct flavour of fruit and tend to be softer and rounder than those from the Cognac region.